platform - Never Hide #Campaign4change. The communication campaign features a series of eight unique creatives shot by the photographer and videographer Cheryl Dunn and showcase the iconoclastic, Never Hide spirit that lies at the heart of the Ray-Ban brand, bringing to life inspirational individuals as pioneers, trailblazers and rule breakers in their everyday lives, ready for a change. The protagonists of these shots are telling their first #Campaign4change stories. Designed for those who want to celebrate their individuality, stand apart from the crowd and show what you really believe in, the latest collection fuses classic styles with a contemporary attitude for lovers of Ray-Ban yesterday, today and tomorrow. This #Campaign4change is also the hero of a consumer activation. 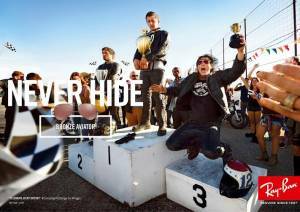 Users are invited to visit ray-ban.com, join the Order of Never Hide - Ray-Ban “secret but not secret” community - create and share their #campaign4change. The Order will help people to get their change messages out to the world. Winners will be celebrated at an exclusive Ray-Ban party in New York in October and their #campaign4changes will be projected at Time Square during the same day.